Sutherland Canvas Tarras Bag by Brady. The Sutherland tarras bag by Brady is a spacious bag with a net pocket front. It features a back panel and base, a zipped inside pocket and a large pocket on the outside back with pen pockets. Leather straps fasten the flap onto the brass buckles. 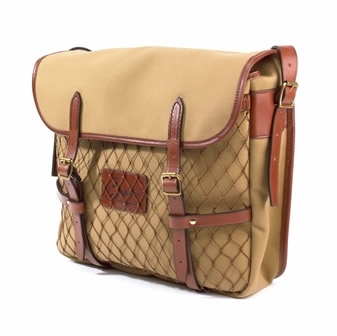 It has leather bound edges and a wide webbing shoulder strap. (35cm x 11cm x 38cm).